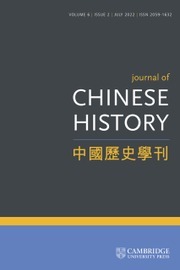 The Journal of Chinese History / 中國歷史學刊 publishes research articles, review essays, and book reviews on all periods of Chinese history and all sub-specialties of history—social, cultural, political, economic, and intellectual. The journal aims to keep its readers abreast of important trends in historical scholarship and welcomes inquiries about review essays and special issues on focused topics. Innovative articles of any length will be considered, but there is a preference for articles of broad interest to Chinese historians and ones of moderate length (8,000 to 14,000 words).